The French Guillotine blade was specially designed in Thiers (Puy-de-Dôme), in the purest tradition of French knife-making. It bears the"French cutlery” certified quality label. 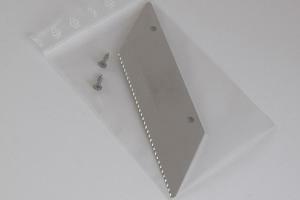 It is delivered with two stainless steel fastening screws. Compatible with the French Guillotine «Goliath» (ref. GS30) and the French Guillotine "Goliath Le Plateau” (ref. GS35). IMPORTANT: Be careful when handling as the Guillotine slicer blade is razor sharp.